Many people wait as long as possible to withdraw funds from tax-deferred retirement plans such as IRAs and 401(k)s in order to give their investments more time to grow. But the IRS won’t let you postpone the income taxes indefinitely. Once you reach age 70½, you generally must begin taking required minimum distributions (RMDs) from these accounts each year, whether you need the money or not, or face a penalty equal to 50% of the required amount that was not withdrawn. Annual RMD amounts are based on your account balances (as of December 31 of the previous year), your age in the current tax year, and your life expectancy as defined in IRS tables. 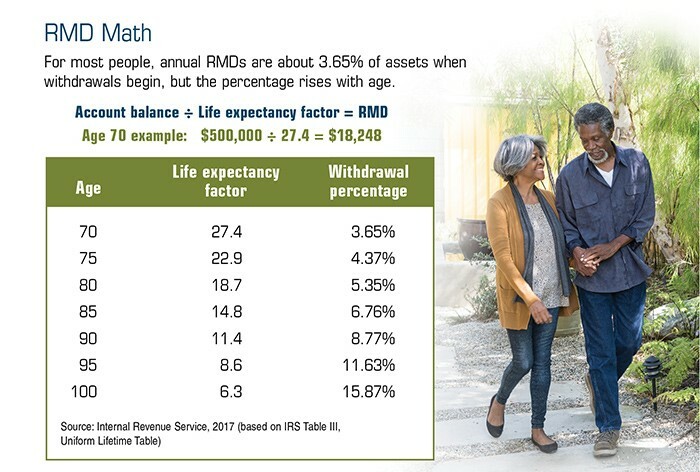 To calculate your RMDs, simply divide the value of each retirement account balance by the distribution period in the IRS life expectancy table. Required minimum distributions must start for the year in which you turn 70½, but you have a one-time opportunity to wait until April 1 (not April 15) of the following year to take your first distribution (however, doing so requires taking two distributions in one year). For example, if your 70th birthday was in October 2017, you will turn 70½ in April 2018 and must take an RMD for 2018 no later than April 1, 2019. You must take your 2019 distribution by December 31, 2019. Be aware that your RMD for the year must be taken before any account rollover (or a Roth conversion) can be made. Otherwise, the rolled-over RMD amount could be considered an excess contribution, which is subject to a 6% penalty for each year it remains in the account. If you continue working into your 70s, you can wait to take RMDs from your current employer’s 401(k) plan until after you retire, but you still must take RMDs from other tax-deferred accounts (except Roth IRAs). Toward the beginning of the year, retirement plan administrators typically send a notice about the amount of any RMD due by year-end. Still, it’s important to understand which RMDs can be combined and which accounts must distribute separate RMDs. Traditional, SEP, and SIMPLE IRAs. One of the benefits of IRAs is that RMDs for multiple accounts can be aggregated. Each RMD must be calculated separately but can be taken from any IRA owned by the same person. Let’s say you have two IRAs, and your RMDs are $10,000 and $8,000, respectively. You can take whatever amount you want from one or both accounts as long as your withdrawals add up to $18,000 (or more). Employer plans. 403(b) accounts follow rules similar to IRAs: RMDs must be calculated separately, but can be taken (in whole or in part) from any of your 403(b) accounts. RMDs from 401(k) and 457(b) accounts cannot be aggregated. RMDs must be calculated for each individual plan and taken only from that plan. Also, RMDs for one type of account can never be taken from a different type of account. For example, a 401(k) RMD cannot be taken from an IRA. Plus, RMDs from different account owners may never be aggregated, so one spouse’s RMD cannot be taken from the other spouse’s account, even if the couple files a joint tax return. If you have multiple tax-deferred accounts, coordinating RMDs could be quite complicated. Before you take any specific action, be sure to consult with your tax professional. Distributions from traditional IRAs and most employer-sponsored retirement plans are taxed as ordinary income. Withdrawals taken prior to age 59½ may be subject to a 10% federal income tax penalty, with certain exceptions as outlined by the IRS. If you’d like to take a different approach to investment planning and management, you can meet with one of our CFS* financial advisors. We will review your finances at not cost or obligation, explain your investment options, and help you find the right products for your needs. For your complimentary consultation, please schedule an appointment with a CFS* Financial Advisor at Consumers Credit Union by calling Micki at 269.488.1776. The investment services team can provide strategies to help fit your ever-changing needs. This information is not intended as tax, legal, investment, or retirement advice or recommendations, and it may not be relied on for the purpose of avoiding any federal tax penalties. You are encouraged to seek advice from an independent professional advisor. The content is derived from sources believed to be accurate. Neither the information presented nor any opinion expressed constitutes a solicitation for the purchase or sale of any security. This material was written and prepared by Broadridge Advisor Solutions. © 2017 Broadridge Investor Communication Solutions, Inc.